When it comes to cooking, baking, or “creating” in the kitchen, I’ll take any shortcut I can get. That’s just the lazy girl in me. I’ll do anything to keep cleaning to a minimum or not have to do something. 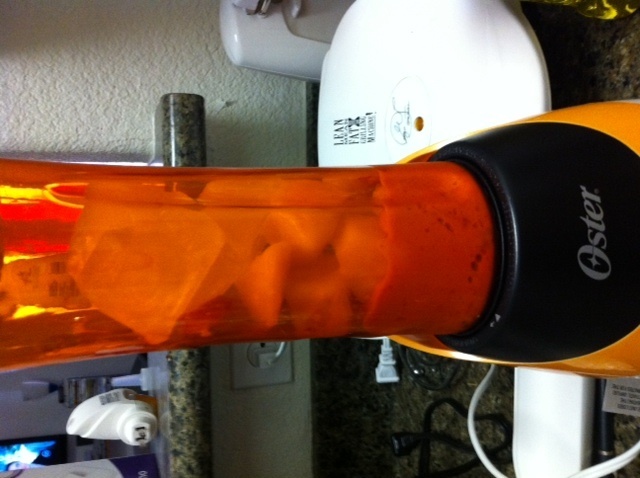 You may remember this post, where my mom told me to go pick up an Oster blender. Well I finally picked it up from SAMs Club, where they hid it in the college section, no where near the rest of the kitchen appliances. So I took this bad boy home and was kind of at a loss for what I was going to use it for. It comes with the stand, one blender piece with the blades, and two bottles with lids. I figured it would be perfect for a smoothie. I filled one of the blender bottles with the fruit, ice, and a lil bit of 2% milk. With the bottles you attach the blade attachment to the bottle, and then snap it in place to the stand. 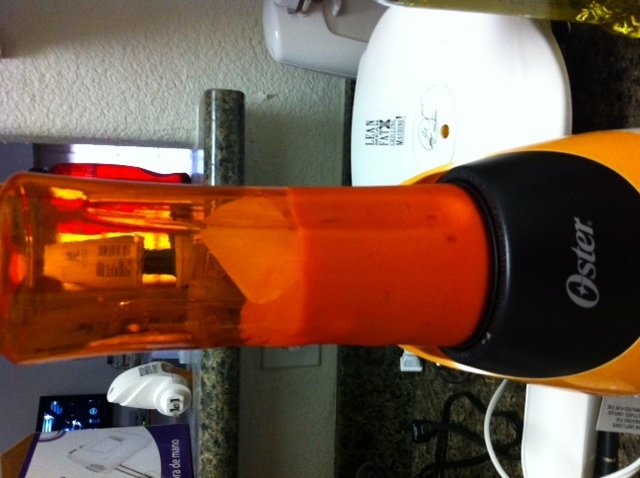 There is no start/stop switch, once the blender is plugged in and the blade attachment is in place it just goes ( I may have jumped when all the sudden the blender started after I plugged it in). Yeah not as quick as I thought it would be. After another minute or so I gave up and just started drinking what was there. All the fruit was blended, there was lil pieces of ice but not too bad. The full sports bottle pre-blending ended up only being half of the bottle post blending. I learned a few things from this. 1. I would not put ice in next time, unless I was using fresh fruit (but I’m too lazy to cut that). 2. I want to try a lil greek yogurt mixed in for protein and thickness. 3. 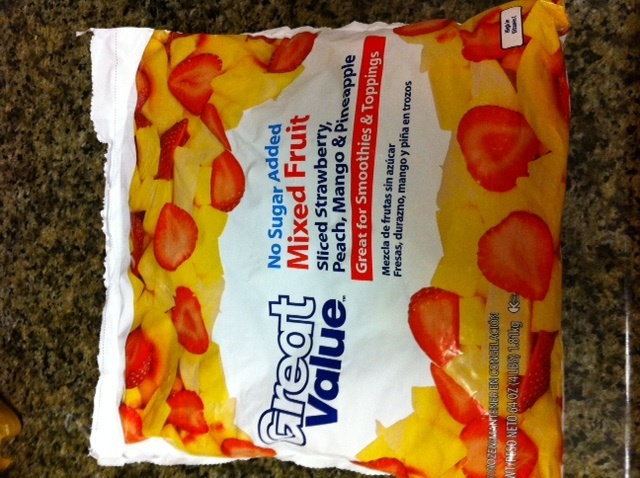 It needs sweetener since the fruit has no sugar added. I may look for stevia to try out, or maybe my generic splenda. The smoothie was good, but could use improvement. 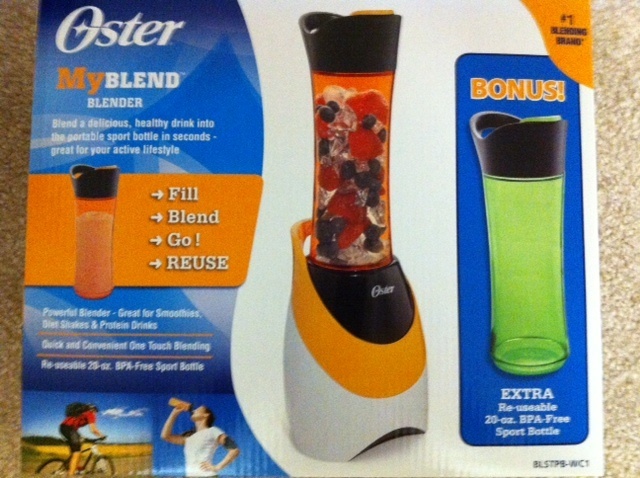 The oster blender is cool, but definitely takes some time (especially with ice or frozen fruit). I can’t wait to try out some new smoothie options soon. If you’re looking for some serious smoothies, check out Julie’s blog, she’s the queen of smoothies! She seriously has a whole smoothie section. I made my first smoothie the other day! I used frozen bananas, strawberry’s, strawberry banana chobani yogurt, and about a cup and a half of milk. It was delicious! 🙂 How have I gone all my life without making smoothies is what I want to know! thanks aunt patty! as you know I’m picky and bananas and blueberries just aren’t my fav, but i will definitely look at fresh fruit at the grocery store. I’m glad you like my blog and I can’t wait to see you in a few weeks!